Poach about 1 pound of boneless skinless chicken breast in chicken stock and water. Using 2 forks, gently thread chicken into small chunks. You can also shred your chicken in your (Kitchenaide) stand mixer using the flat, paddle beater. In a bowl, combine shredded chicken with Franks Red Hot sauce, to taste. Let the chicken soak in the hot sauce until ready to use. 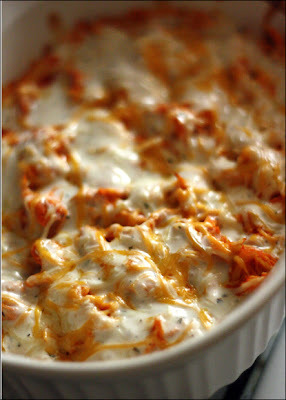 Spread one 8 oz container of cream cheese into the bottom of an un-greased baking pan or casserole dish. Sprinkle on some cheese. I like a mexican cheese blend, but you can also use blue cheese or gorgonzola. Finish it off by drizzling on some Ranch dressing. Bake at 350 degrees for 20-25 minutes, until dip is melted and bubbling. Serve with chips and veggies for dipping!